Very small dimensions, just 63x50x35mm. Adjustment for Picture Size, Servo Gain, LFD, HFD, Offset and linearity. Inverting jumper. 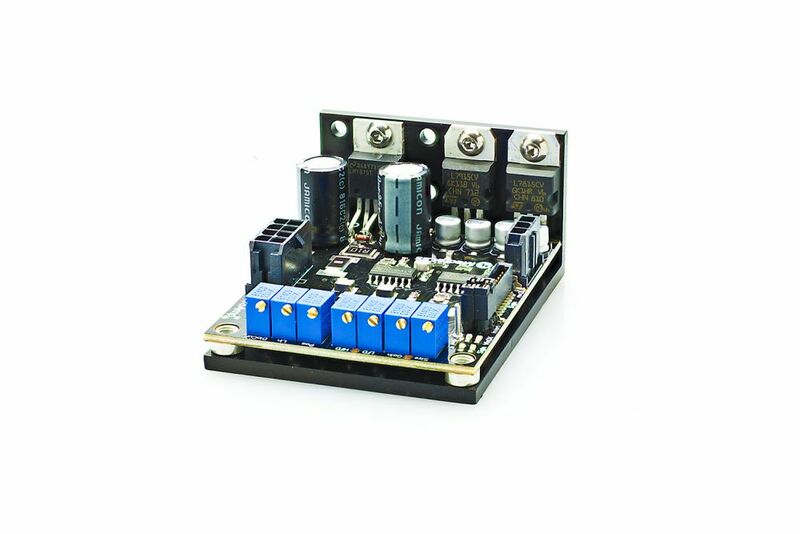 Needs source of +/- 18-30VDC at 1A per voltage. Step time can be as low as 100uS at small step, with CTi 6210HB galvos and small mirrors. The PID servo controller interprets the feedback signals of the position sensor compared to the target signal of the input and transmits the voltages and currents to the motor necessary to reach the desired position are rapidly as possible. The high-speed control loop with integration link delivers excellent, responsive movement with the fast acceleration and braking ramps which are necessary for the fastest positioning movements and the lowest jump times. The damping links ensure that settling times are kept as short as possible. This made is possible to achieve further gains in terms of precision and reproducibility. On the driver itself, the axis movement can be inverted with a jumper. The inputs are designed to be fully symmetrical, allowing for floating earth actuation. This drastically reduces earth loops or interference. This makes it possible, with a two-wire cable, to eliminate interference, as the interference signals cancel each other out. The 8-pin connector provides all of the inputs and outputs for the driver. This is also where the connection is made to the power supply. Buffered position outputs also fed out of the connector. The MicroAmps are relatively durable when it comes to overheating on the output stage. The integrated protection against overheating switches the output stage off if the temperature is too high, so that no defect occurs. To ensure sufficient cooling, the MicroAmp should be mounted to an adequately dimensioned metallic surface. The temperature on the back part of the heat sink should be below 70°C.